Alarmingly hedgehogs are declining rapidly in the UK, from 35 million in the 1950s to an estimated 1 million today! Hedgehog Awareness Week hopes to highlight the need for us all to become ‘Hedgehog Champions’. The good news is that Whittlesford has an evident hedgehog population! Let’s support them by creating a village ‘hedgehog highway’ by making sure our gardens are all accessible. If you have fences, consider cutting a hole in the bottom (roughly the size of a CD is perfect) or if you have walls, create a tunnel underneath … and encourage your neighbours to do the same. You could leave some food and water out in the evening (never milk as hedgehogs are lactose intolerant). They enjoy jelly based cat and puppy food (but not fishy varieties), kitten biscuits, meal worms and specialist hedgehog foods. If you have cats in the area, cover the food with a plastic box with an access point and pop something heavy on top to stop them helping themselves before the hogs are out and about. Carry out a health and safety check on your garden: Hedgehogs love swimming so a pond is great but ensure there is a shallow end or ramp so they can climb back out. Make sure there is no rubbish, such as empty cans or plastic bags and ensure netting is safe. Do not use slug pellets as these are harmful – hogs will eat all your slugs. Check under bushes before you strim – a hedgehog could be nesting there and many are injured in this way. Check before you light bonfires … these are great places for hogs to nest in. Make your garden hedgehog friendly: A compost heap is a great place for the bugs they like to eat and also for them to nest in. Have an ‘untidy’ corner with a pile of logs and leaves – again for nesting and to encourage insects. Consider getting a hedgehog house and site it in a quiet, protected area of your garden … you might be lucky and have a resident sleeping, nesting or hibernating there. 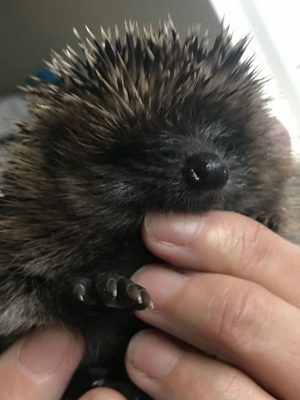 If you find a hedgehog out during the day, it is most likely in trouble (the exception being Mums’ feeding hoglets – but these are usually dashing around and clearly not unwell) … pop it in a cardboard box with newspaper and straw or an old blanket, keep it warm and offer it some water and food if you have something suitable. Then phone Shepreth Hedgehog Hospital for advice on 07505 651968, out of hours emergency only number 07981847687.